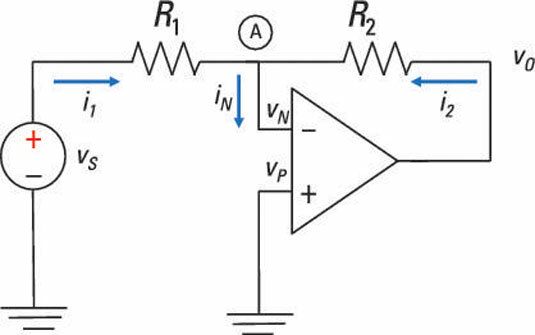 An inverting amplifier takes an input signal and turns it upside down at the op amp output. When the value of the input signal is positive, the output of the inverting amplifier is negative, and vice versa. Here is an inverting op amp. The op amp has a feedback resistor R2 and an input resistor R1 with one end connected to the voltage source. The other end of the input resistor is connected to the inverting terminal, and the noninverting terminal is grounded at 0 volts. The amount of amplification depends on the ratio between the feedback and input resistor values. For ideal op amps, the voltages at the inverting and noninverting terminals are equal and set to zero. The inverting terminal is connected to a virtual ground because it’s indirectly connected to ground by vP. Again, the amplification of the signal depends on the ratio of the feedback resistor R2 and input resistor R1. You need only external components of the op amp to make the signal way bigger. The negative sign means the output voltage is an amplified but inverted (or upside down) version of the input signal. For a numerical example, let R2 = 10 kΩ and R1 = 1 kΩ. In that case, the inverted output voltage vO is ten times as big as the input voltage vS. In nothing flat, you just made a weak signal stronger. Nice work — you deserve a raise! Resistors should be around the 1 kΩ to 100 kΩ range to minimize the effects of variation in the op amp characteristics and voltage sources.